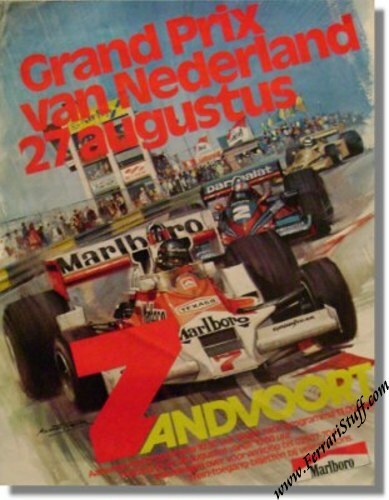 Original 1978 Zandvoort GP Race Poster. Great art work showing James Hunt's # 7 Mclaren M26 being followed by John Watson in his # 2 Brabham Alfa Romeo. The race was a 1-2 for Lotus with Mario Andretti winning the race ahead of Ronnie Peterson, both on Lotus 79. Gilles Villeneuve brought his # 12 Ferrari 312T3 home in 6th place ahead of his team mate Carlos Reutemann who finished 7th. Near mint condition with a small folds in the top left corner. Will be shipped, rolled, in a sturdy tube.